Elements in Abaqus have integration points for which stress, strain and other element variables are calculated. To visualize these results in contour plots in Abaqus/Viewer, the data needs to be extrapolated to the element nodes via so-called computations. This post describes the difference between the GUI options Compute scalars before averaging and Compute scalars after averaging. Extrapolation is the first computation applied for simulations results saved at the element centroid or integration points. The extrapolation order depends on the element type; for second-order, reduced-integration elements Abaqus/Viewer applies linear extrapolation to calculate the nodal values of the element variables. The nodes common to two or more elements receive extrapolated values from all contributing elements, as shown in the picture below. In this simple example the black nodes are receiving values from the integration points of the elements E1 and E2. For tensorial output like stress and strain, the 2 or more extrapolated results (the white points in the figure below) may be converted in a single averaged scalar (black point). In the following sections the 2 required steps for this are discussed: scalar computation and averaging. Scalar computation converts the tensor values into a single scalar value. For example, the S11, S22, S33, S12, S23 and S31 stress components are used by Abaqus/Viewer to determine the Mises stress. Averaging computation converts 2 or more values from the different extrapolated nodal results into a single nodal result. 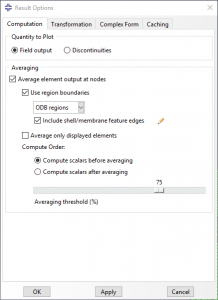 Abaqus/Viewer provides control over the order of averaging results and computing scalar values. The default option of Abaqus/Viewer is Compute scalars before averaging, in which the scalars are first computed from the extrapolated tensors and then, the average scalar value is determined. The alternative option is Compute scalars after averaging, in which the tensors are first averaged and then scalar scalar value is determined from the averaged tensor. The Averaging threshold controls the extent of averaging between neighbourhood elements and is only available for the compute scalars before averaging option. If the relative difference between contributions at a node is greater than the defined threshold percentage, the contributing values are not averaged. An averaging threshold value of 0 suppresses all averaging; a value of 100 averages all results. 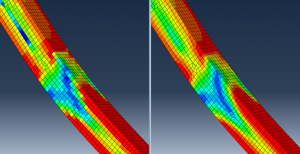 The higher the percentage, the smoother and more continuous the simulation results will look, as shown in the picture below (simulation results with different averaging threshold values, left: 0 and right: 100). On the other hand, large gradients in the results or even discontinuities may not be noticeable anymore if higher averaging thresholds are being used. The various settings are defined in the computation tab of the Results Options dialog. You can open the dialog in Abaqus/Viewer by selecting Result –> Options. The user control over the results averaging and scalar computations doesn’t change the results of your analysis but the way the results are processed and presented in the GUI. For good quality meshes the various averaging options yield very similar results.